"Know your opponent and know yourself - make one hundred challenges without hazard"
A midfield general, Sun Tzu marshalled his players well, before firing shot after shot into the opposition penalty area. Gift-wrap service. 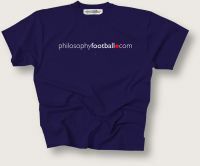 With Exclusive Philosophy Football wrapping paper and gift tag. To personalise your tag type in the message you would like us to add into the box also below.